At Practical Outcomes we believe you should be able to get studying as quickly and easily as possible. Practical Outcomes provides government funding to eligible students as well as interest-free payment options. Subsidised training is available to eligible individuals through the Victorian and Commonwealth Government. Candidates may be required to pay a co-contribution depending on the qualification being undertaken. To find out the applicable student contribution by course, please refer to the tuition fees above. If you choose to access a training place subsidised by the Victorian and Commonwealth Governments under the Skills First Program to enrol into a course, your future training options and eligibility for further government subsidised training places under Skills First Program, may be affected. If you are accessing a government subsidised training place you may be requested to participate in a National Centre for Vocational Education Research (NCVER) survey, Annual student outcome survey or give feedback to the Department for a review, audit or investigation purposes. To check your eligibility, visit The Department of Education and Training of Victoria State Government. a) from the Judy Lazarus Transition Centre (as a prisoner within the meaning of the Corrections Act 1986). b) who is a young person on a community based orders required to undertake the course pursuant to a community based order made under the Children, Youth and Families Act 2005.
c) Who is a Young Person Transitioning From Care Initiative (Provider Network Training Providers only) an individual referred to them with a standard Young People Transitioning From Care Referral Form. Catalyst Plus interest-free student loans help you get your study started faster. 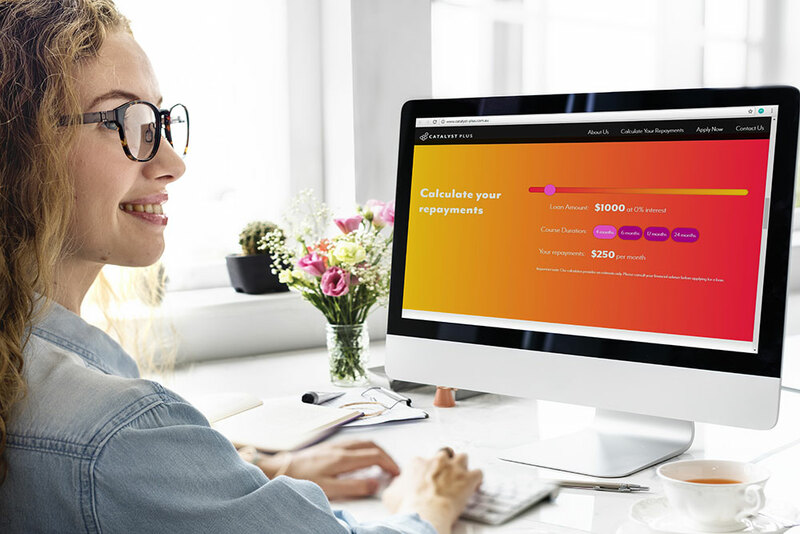 With no hidden fees, fast approvals and no extra forms, Catalyst Plus student loans help you get enrolled and studying, so you can focus on your qualification and building your future. Calculate your repayments. To learn more about our other course payment options, such as Direct Debit or Credit Card or to find more about Catalyst Plus interest-free student loans call our friendly course advisors on 1300 799 610 or complete the inquiry form below.